The regulation text is structured in sections. 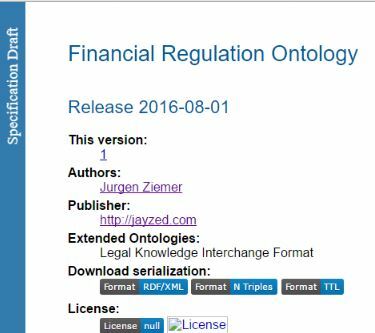 Topbraid Composer Maestro Edition11 (TBC) is our main ontology editor. First we import the XSD-Schema. There are various options to customize the import. The tool creates on OWL file CFRMergedXML.ttl with classes for the XSD elements. The second step is to open CFR-2012-title17-vol3-part275.xml with TCB’s “Semantic XML”. This show instances of the classes with the actual XML text fragments. Note that this is only a semantic rendition. The underlying file is still XML. Finally we export the graph to create save it as OWL. This is for convenience and performance, so we don’t have to repeat the import steps. CFR XML schema definition saved as ontology file. •Above, our Private Fund Exemption rule section. Below the generated OWL. •The XSD elements became classes. The XML content has been generated as instances of the schema classes. •We define a parent class, CFRpart275 and make all generated classes subclass of it. The list to the right shows the 50 generated classes and their number of instances. We should consider this a set of dumb Staging classes rather than ontology design. The core classes are section with 44 instances and paragraph with 757 instances. Most of the other classes become data properties. The TopBraid Composer Resource form shows the properties of our “Private fund adviser exemption” generated as an instance of SECTION. •“composite:child” is the object property generated for all XML groups and elements within the SECTION: Section number, subject, note, citation and many paragraphs. The paragraph in turn has a composite child for the actual text instantiated in “sxml:TextNote”. There are no semantics and it is hard and error prone to SPARQL query the data. structure into true ontology design.